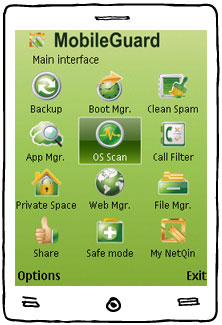 NetQin Mobile Guard for Symbianis the world's first software provided with the feature of boot acceleration and it is designed to improve your mobile phone performance by removing junk, minimizing power consumption and protecting your mobile phone against malware. Calls and messages from Blacklisted numbers can be rejected and filtered by selecting or customizing the rejection mode to protect you from spam messages and unwanted calls. ...... This product also helps manage internet usage with monthly limits, a connection log, and even a real-time traffic bar with rainbow-colored that keeps you aware of how much traffic is used anytime and anywhere. A big part of a device lagging is the overdose of applications running on it. This feature allows users to close running applications on the device, improving the speed of your device. It makes your whole system optimized for better performance by switching off all unnecessary processes that are not in use. Calls and messages from Blacklisted numbers can be rejected and filtered by selecting or customizing the rejection mode to protect you from unwanted calls. It disallows spam messages from showing a text alert; hence forth disallowing users from being distracted by these spam messages. Guard CS - monitoring: computers networks, applications programs, folder, etc. Data security tool for advanced access right control, encryption and audit. Qweas is providing links to NetQin Mobile Guard for Symbian 3.0 as a courtesy, and makes no representations regarding NetQin Mobile Guard for Symbian or any other applications or any information related thereto. Any questions, complaints or claims regarding this application NetQin Mobile Guard for Symbian 3.0 must be directed to the appropriate software vendor. You may click the publisher link of NetQin Mobile Guard for Symbian on the top of this page to get more details about the vendor.